Peninsula Chamber endorses National Park designation of Fort Monroe. Chamber Executive Mike Kuhns testified at the NPS meeting July 19, 2011 at the Hampton Roads Convention Center. The Virginia Peninsula Chamber of Commerce, representing the Virginia Peninsula’s business community’s interests, enthusiastically supports the creation of a Fort Monroe National Park and applauds the constructive approach put forth by the Virginia Congressional Delegation, Governor Robert McDonnell, Hampton’s Mayor Molly Joseph Ward, the Fort Monroe Authority, as well as our nation’s historic preservation and conservation communities. The Peninsula Chamber, furthermore, agrees with U.S. Secretary of the Interior Ken Salazar when he said that Fort Monroe is a "crown jewel that must be protected” and the National Parks Director Jonathan B. Jarvis, when he said the fort represents the "quintessential American story." Fort Monroe encapsulates our American history in a way not repeated elsewhere, with lessons learned as a consequence of our actions as a nation “of the People, by the People and for the People”. The memory of the arrival, here, of the first Africans in the New World in 1619 and, later, the “Contraband” decision of General Butler and its impact on the emancipation of African-Americans should be memorialized for future generations. The Early American and Native American history, the celebration of the first Christmas in a nearby Kecoughtan Indian village in Hampton; and the military history of the largest stone fort built in this country are all worthy of preservation as a national treasure, and would complement the region’s other treasures of Jamestown and Yorktown, both with National Park Service designations. The positive economic impact of the creation of a Fort Monroe National Park would include new job creation, new local investments, increased tourism, and an improvement in the quality of life through the creation of an urban park. The National Parks Conservation Association reports that the National Park Service generates more than four dollars in value to the public for every tax dollar invested by the Federal Government. In addition to that, National Parks boost local private-sector economic activity and private-sector jobs. It has been reported that National parks attract businesses and individuals to the local area, resulting in economic growth in areas near parks that is an average of one percent per year greater than statewide rates over the past three decades. In summary, with the designation as a National Park, Fort Monroe, “Freedom’s Fortress”, and the area surrounding it will be a permanent testament to what America stands for …. the freedom to become something better today, than we were yesterday, recognizing that it is less than what we strive to become tomorrow. 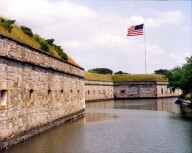 The Virginia Peninsula Chamber of Commerce, on behalf of the Peninsula business community and in support of our local, state and federal leaders, respectfully asks the National Park Service to designate Fort Monroe, “Freedom’s Fortress, a National Park. Click here to read the brief history of Fort Monroe and why it should become added to the National Park System. Click here to learn more about the Past, Present, and Future of Fort Monroe. Click here to learn more about the Fort Monroe Public Support assessement or to comment on this subject.